BLOOMINGTON, Ill.— Lisa Mishra ’15 (Hoffman Estates, Ill.) got much more than a job two years ago when she was looking for an on-campus position at Illinois Wesleyan University. She found a cause that has defined much of her college experience. Through her campus job as a Multifaith Ambassador, Mishra became aware of student interest in resources for non-Christians. Mishra researched possibilities for shared space for her proposal for one of the Andrew W. Mellon Foundation’s Re-Centering the Humanities grants. As a recipient, Mishra has investigated the creation an interfaith prayer space on campus. Guided by Assistant Professor of Religion Nawaraj Chaulagain, Mishra has researched worship practices across five faith groups. Aided by University Chaplain Elyse Nelson Winger, Mishra has researched challenges and successes of multifaith centers on other college campuses. Mishra’s work on the project began in the 2013-2014 academic year, when the Multifaith Ambassadors Program (MAP) and IWU Interfaith sponsored three panel discussions seeking student input. Panelists asked if students were interested in an interfaith space and then asked them imagine what such a space might look like. “The emerging consensus was that an interfaith space was vital to sustaining our mission to engage diversity,” said Mishra, who is double majoring in economics and religion. She said the concept has been embraced by a number of current faith-based religious groups on campus. 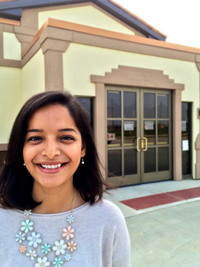 Raised in the Hindu faith in her native India, Mishra moved to Chicago as a young girl. She said hers was a “pretty devout upbringing” but said she became more nonreligious after starting college. Mishra’s passion for multifaith work has inspired her to add the religion major as she begins her senior year. She plans to apply to divinity schools to earn a master’s degree in theological studies. She said the biggest surprise in her research was discovering Illinois Wesleyan was not envisioned as a Methodist institution at the outset. When the 30 founders came together to establish “an Institution of learning of Collegiate grade,” a sponsor was needed, with the founders finding support in the United Methodist Church. Learn about other 2014 Mellon Scholars.